Some vegetarians who miss eating meat find late November to be a tough time of the year, because a vegetarian Thanksgiving can't always compare to one featuring meat-based dishes. But other vegetarians and vegans love the holiday and enjoy their special foods just as much (if not more!) than meat-eaters do. It's easy to be a grazer at Thanksgiving and just munch on all of the traditional vegetarian side dishes available, but it's not that much harder to go a bit further and prepare a few very special dishes. 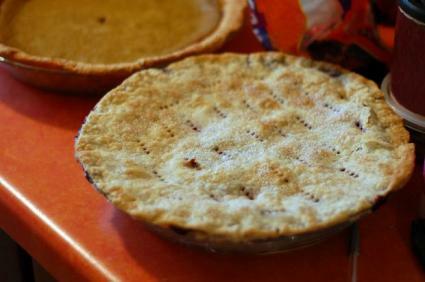 There are lots of delicious meat-free alternatives to the traditional Thanksgiving turkey. Vegetarians are constantly being asked what they eat on Thanksgiving by confused but well-meaning relatives and friends, so if you're hosting a vegetarian this year, consider offering a simple main-dish option that doesn't contain meat. Tofurky is a popular choice and is widely known by both vegetarians and meat-eaters everywhere. It's not the only tofu turkey out there, though, and other meat-free options are only as far away as a local grocer's refrigerator section. Most are soy- or wheat-based but don't have a traditional tofu taste and instead have very convincing flavors of turkey, gravy, and stuffing. One of the most comforting autumn foods is a warm, rich casserole, which is another winning option for a main-course dish in a vegetarian Thanksgiving dinner. Meat-free options that will please both vegetarians and non-vegetarians include vegetable lasagna, ratatouille, spanakopita, vegetable gratin, vegetable chili, cornbread pie, and risotto. Many Thanksgiving dishes, even if they're meat-free, are loaded with fat and calories. Making vegetables the focus of a dish allows you to present complex flavors in a more wholesome and healthy way. You can also feature seasonal items that will save you money and look just as lovely as a big spread with a turkey. Try baking a large, hollowed-out pumpkin or squash and stuffing it with a roasted vegetable and herb mix. 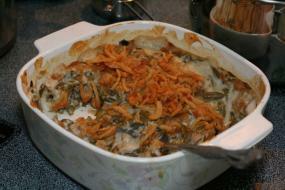 Green-bean casserole is a favorite vegetarian dish at Thanksgiving. If a lone vegetarian in your family doesn't have a main-dish alternative to turkey, he or she can still enjoy plenty of traditional Thanksgiving side dishes. Green-Bean Casserole: It might not be one of the healthiest dishes at the table, but a helping of green-bean casserole is worth an occasional splurge to many vegetarians. To lighten the dish, consider reducing the amounts of butter and cream and redesigning the recipe to focus on the flavor of the beans. Cranberries: One of the better options for health-conscious vegetarians, cranberries and cranberry jelly have intense flavor that signify Thanksgiving just as much as turkey does. If you're interested in serving these berries in a new way, try baking them into a dessert or some scones. Mashed Potatoes: This popular side dish can be vegan-friendly if it's made without cream and butter, and it's a filling whole food that vegetarians can enjoy right along with their meat-eating counterparts. Gravy: Though not technically a side dish by itself, a strong recipe for vegetarian gravy can be served with mashed potatoes and a turkey substitute to round out a meal. If you're looking to serve something a little more special than usual at the Thanksgiving table this year, look into these options. Souffle: A smoked-cheddar soufflé or roasted-vegetable quiche take advantage of classic fall flavors and are easy to present in an upscale way. Try serving with a salad of fresh winter greens. Stuffed Gourd: A vegetarian stuffed pumpkin, squash, or another gourd looks every bit as impressive as a big turkey and can play host to a number of different savory fillings. Squash and Veggies:Braised artichokes, stuffed mushrooms, sautéed shallots, and roasted squash are all prime fall vegetarian ingredients that can play a starring role in a vegetarian Thanksgiving feast.